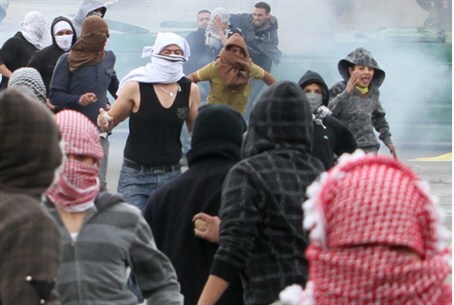 PA media reports clashes between soldiers, local Arab men near Jenin. Israeli soldiers clashed with residents of a Palestinian Authority-controlled Arab town near Jenin on Saturday night, according to the Bethlehem-based Maan news. Soldiers reportedly entered the town of Al-Shuhada to distribute summons to two local men who are wanted for questioning. According to the report, clashes broke out when soldiers entered a local car dealership. Soldiers used tear gas to deter attackers, causing locals to “suffer from excessive tear gas inhalation,” according to Maan. Earlier this year an IDF arrest operation in Jenin turned into a shootout. Several Arab men hurled stones at soldiers who had come to arrest a suspected terrorist – providing cover for terrorists, who opened fire on soldiers during the rock attack. Soldiers fired back, hitting and injuring one person.